Unique to the McKenzie Method, the process begins with a thorough history and testing of movements to identify distinct patterns of pain responses that are: reproducible, objective, reliable, and reflect the characteristics of the underlying pain generator. The most common and meaningful pattern of pain response is Centralization, which is well documented now in literature as both a diagnostic tool and a prognostic indicator. This is defined as a patient’s referred or radiating pain (whether just slightly off the center, into the buttock, or all the way to the toes) promptly reversing, returning to the center of the back, and then usually also abolishing. Whether the patient’s pain is acute or chronic, if Centralization occurs through this logical step-by-step assessment process, good outcomes are favorable, It provides a benefit to the patient and practitioner by eliminating the need for expensive and/or invasive procedures. Ultimately, it provides a rational guide to the most optimal treatment strategy for a specific patient. Assessment is the first step! Pain is a symptom – not a diagnosis. To successfully treat, one must first effectively evaluate. While every patient can benefit from the McKenzie Method® of mechanical assessment, not all patients will be suitable for mechanical therapy – and this is determined quickly so that alternative treatments can begin as soon as possible. MDT credits the patient’s ability to learn the principles and be in control of their own symptom management, reducing their dependency on medical intervention and gaining life-long pain management and preventive skills. 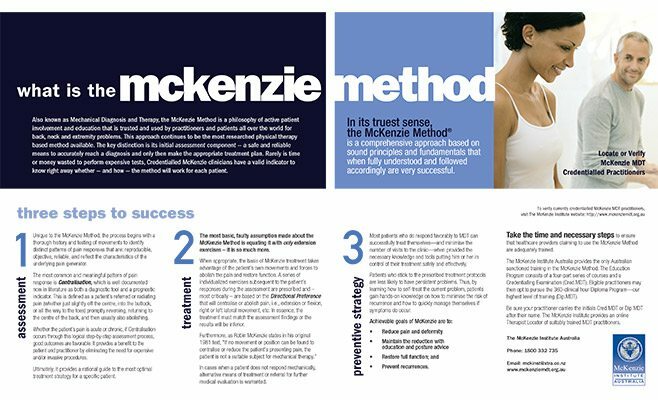 The McKenzie Method® addresses a growing demand from patients and third-party payers from professional rehabilitation services that educate the patient and develop the patient’s self-treatment skill in a cost effective and time-efficient manner. We hope you might consider referring those patients with orthopaedic conditions/injuries to MidSouth Orthopaedic Rehab. Please click through to find our contact information. (3) The McKenzie Method® – Literature Relevant to the McKenzie Method Accessed 2008 August 14.